HMS Belfast in London has launched a new experience called Kip in a Ship, which allows school groups to spend a night on-board the historic vessel. HMS Belfast is a museum ship, originally built for the Royal Navy, which is permanently moored on the River Thames in London and operated by the Imperial War Museum (IWM). 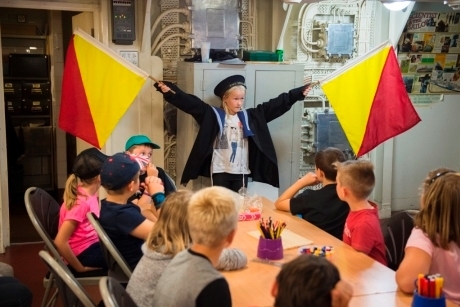 Pupils between the ages of seven and 18 can experience a night on-board the ship to uncover its history which extends to the Artic convoys, D-Day, the Cold War and Korea. The experience, Kip in a Ship, offers groups the chance to immerse themselves in HMS Belfast’s history by sleeping in the real sailors’ bunks, ducking through hatches and climbing up and down ladders to explore the ship. The experience can cater for up to 52 children at a time. Also included will be a continental breakfast and a morning lesson whereby children can discover the stories of the crew who lived and worked on-board the warship during D-Day and beyond. To enhance the HMS Belfast experience further, you can also book an additional evening package that will include an exclusive guided tour of the Flag Deck and Captain’s Bridge, as well as hands-on activities. These activities involve learning semaphore and flag signals, and designing a mess mug for enjoying hot chocolate – which was believed to be one of the sailors’ favourite drinks on-board. For more information, visit www.iwm.org.uk/learning/hms-belfast/kip-in-a-ship. Boutcher Primary School in Southwark worked closely with artist Imogen Piper to create a new exhibition inside the landmark. Skipton has what is said to be one of the most complete and best preserved medieval castles in England, standing watchful over the market town as it has for over 900 years. The Department for Education has announced an injection of £1.6million into Historic England’s Heritage Schools Programme, allowing the scheme to continue for the next two years.